LIFE AS WE KNOW IT. Romantic comedy with Katherine Heigl (Knocked Up) and Josh Duhamel (Transformers) as a mismatched couple thrown together because they are the godparents of a cute toddler who loses her parents. Will they fall for each other? Duh. 112m. Rated PG-13 for sexual material, language and some drug content. Opens Friday at the Broadway, Mill Creek, the Minor and the Fortuna. MY SOUL TO TAKE. Bloody slasher flick in the classic form, with a serial killer called "The Ripper" offing teens one by one. Might be a cut above since it's written and directed by genre master Wes Craven (it's in 3D, but not here). 88m. Rated R for strong bloody violence and pervasive language, including sexual references. Opens Friday at the Broadway, Mill Creek and the Fortuna (in 2D). SECRETARIAT. Disney biopic stars Diane Lane as Penny Chenery, owner of the 1973 Triple Crown-winning racehorse Secretariat. John Malkovich plays the horse's eccentric trainer. Director Randall Wallace wrote Braveheart and Pearl Harbor; expect upliftment. 116m. Rated PG for brief mild language. Opens Friday at the Broadway, Mill Creek and the Fortuna. HEARTBREAKER (L'Arnacoeur). French romantic comedy about a professional service that breaks couples up. Their prime asset is the handsome, charming heartbreaker Alex (Romain Duris). When he's hired to stop the marriage of Juliette (Vanessa Paradis), well, love steps in. Kinda sounds like an American rom-com, doesn't it? 105m. Not rated. Opens Friday at the Minor. For years now, Maestra Carol Jacobs of the ArMack Orchestra has put together soundtrack music to accompany classic silent films. This year's selection is the seminal horror flick Phantom of the Opera, with Lon Chaney in the title role. Screenings are Thursdays through Saturdays -- this weekend at Mack High, next weekend at Arcata High. It's the first Thursday of the month, which means First Thursday Film Night at the Morris Graves Museum. This time the documentary is Reel Injun, an exploration of Hollywood's distorted portrayal of Native Americans through the long history of cinema. Thursday is also Ocean Night at the Arcata Theatre Lounge, with the Surfriders and Ocean Conservancy showing the eco-minded shorts The Intertidal Zone and Estuary, along with the surfing feature Sliding Liberia, wherein four young surfers who travel to Liberia looking for waves end up learning lessons about war and peace. Maybe there are surf flicks that are not remakes of Endless Summer. On Saturday the ATL has a special free screening of Sin By Silence, a documentary by Olivia Klaus about domestic violence that examines the lives of women in prison for murdering abusive husbands. Former inmate Brenda Clubine, founder of a prison group Convicted Women Against Abuse, will speak following the film. On Sunday, the Humboldt Browncoats return to the ATL for Joss Whedon's space western Serenity, a continuation of the cancelled Fox TV sci-fi series Firefly. The ATL has two classics for next Wednesday's Sci-Fi Pint and Pizza Night: The Italian-made sci-fi/horror tale The Last Man on Earth, based on Richard Matheson's dark novel I Am Legend, with Vincent Price as a lonely guy fighting off vampire zombies (same basic plot as The Omega Man with Charlton Heston and I Am Legend with Will Smith). It's paired with Herk Harvey's weird cult classic Carnival of Souls, with Candace Hilligoss as an organist caught in a nightmare limbo existence. The WildRivers 101 Film Festival continues with a Thursday screening at Eureka High School of Karuk Voices, a doc about preserving the oral history of the Karuk tribe as passed down by tribal elders. Sunday WildRivers offers four films at the Minor: Savage Henry editor Chris Durant wrote and his former T-S Fat Guys partner James Faulk directed the local comedy Illegal Smile with the late Jack Hanrahan starring as Jack Snider, an unlikeable down-on-his-luck stoner musician struggling to find his way in the world. The feminist western A River of Skulls is followed by a Q&A with writer/director Suza Lambert Bowser. The River Why tells the story of 20-year-old Gus Orviston, "the Mozart of flyfishing," who leaves the big city to find his bliss on the banks of a wild river and gets more than he bargained for. Writer/director Daniel Kremer will discuss Idiotmaker's Gravity Tour, his tale of an aging hippie's (William Cully Allen, also co-writer) spiritual journey to India, with scenes shot there and in Montreal, Long Island and Humboldt. The WildRivers Fest concludes Monday at the Mateel with a pair of docs: River of Renewal, directed by Jack Kohler, examines the water and wildlife crisis in the Klamath Basin from a Native American perspective. The short Generation War, by Meaghen Keyser and Caitlin Lindsey, looks at the war in Iraq though the lens of the Vietnam experience. THE SOCIAL NETWORK. The release of something commonly referred to as "The Facebook Movie" might cause some trepidation, but the film is a pleasant surprise. The opening scene concisely establishes Facebook founder Mark Zuckerberg as intelligent, ambitious, arrogant and socially inept, and the film pivots on the irony of a resentful outsider using his brains to outwit those more socially connected by inventing a virtual social network of exclusivity. Initially inspired by being dumped by his girlfriend, Zuckerberg gets into some computer mischief that gives him a taste of notoriety. After making a verbal agreement to work on a site called the Harvard Connection for the well-connected Winklevoss twins (both played by Armie Hammer through seamless special effects), he instead makes his own social network called The Facebook with financial backing from his friend Eduardo Saverin. Initially an elite site for Harvard students only, it eventually becomes popular with other Ivy League schools, and then the rest of the world. The film tells the story of how Zuckerberg consolidated control of Facebook, cutting loose both rivals and friends in the process. He's portrayed with enough complexity that he can be read as both socially clueless and incredibly savvy. He's concerned with total control of the company, but not so much with money per se. The film supports several simultaneous views of Zuckerberg, and is refreshingly ambiguous. Director David Fincher is only as good as his material, and here the sharp script by Aaron Sorkin serves him well. The circular plot is expertly structured in such a way that a film where a good portion of the action takes place in a legal deposition and behind computer screens is nonetheless gripping and engrossing. The actors are uniformly fine (except for a scene where an out-of-place Prince Albert speaks with a very poor English accent). Andrew Garfield as Zuckerberg's spurned friend Eduardo Saverin is pretty much the only character with much human sympathy, and is quite convincing as a man out of his depth. 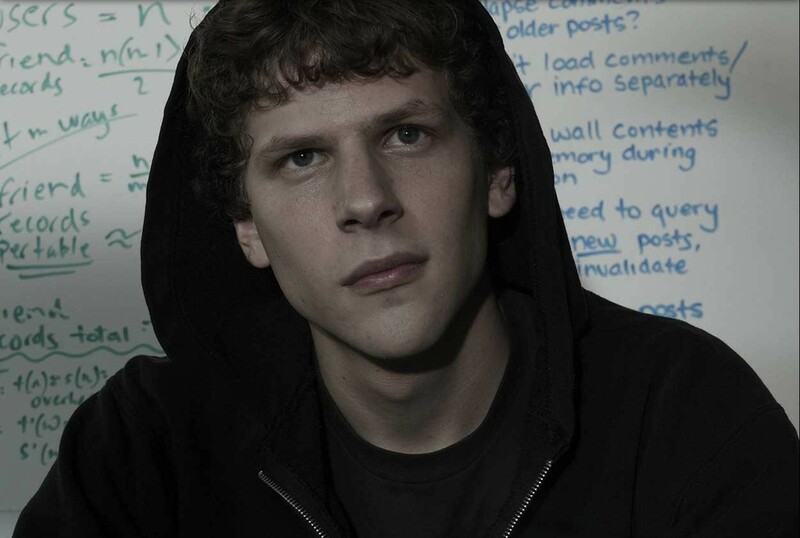 Though Justin Timberlake as satanically silver-tongued Napster founder Sean Parker has the flashier role, Jesse Eisenberg gives a subtle, enigmatic performance as Zuckerberg that never quite lets you in on where he's coming from. Recent comparisons to Citizen Kane and The Godfather are overblown to say the least, but the movie does tap into the current zeitgeist with style and wit. Rated PG-13 for sexual content, drug and alcohol use and language. At the Broadway, Mill Creek, the Minor and the Fortuna. JACK GOES BOATING. Jack Goes Boating reminded me of those 1960s off-Broadway plays I used to inflict on my students. If you are of a certain age, you will remember those depressing and pitiful dramas, set usually in a grungy area of Manhattan, about two damaged people, one male and one female, who cannot relate to anyone around them and whose self-images seem permanently destroyed. Somehow, they find each other and for a brief moment a faint promise of a meaningful relationship flares before the light is extinguished permanently. I don't know if playwright Bob Glaudini, who adapted his successful 2007 Off-Broadway play of the same title for the screen, has any nostalgia for that period of American theatre but, happily, his work is less grim and more humorous than those earlier damaged people stories. At any rate, the film's success rests primarily with the acting, and in this regard Jack Goes Boating comes through nicely. Philip Seymour Hoffman, who also directed the film, reprises the role of Jack from the theatre production, creating an unlikely romantic figure in a portrayal that straddles the line between pathos and humor. But it is Amy Ryan (Gone Baby Gone) who really lights up this film. Her portrayal of the terminally odd Connie is brilliant, a beautifully nuanced performance that captures both the externally physical Connie and the intriguing depths lurking beneath a surface that almost no one in her world perceives except Jack. Jack, a limousine chauffeur for his uncle's company, at least has a mentor in the form of co-worker and close friend Clyde (John Ortiz). It is Clyde and his wife Lucy (Daphne Rubin-Vega) who introduce Jack to Connie. Clyde also patiently teaches Jack how to swim after Connie reveals on their first date that she dreams of going boating. The road to romance proves extremely rocky for Jack and Connie, but the story plays out with appropriate humor in the midst of inevitable setbacks. The film ends with a nice touch of irony, a more interesting conclusion than those provided by the ’60s plays. Recommended. Rated R for language, drug use and some sexual content. 89m. Ends Thursday at the Minor. CASE 39. Social worker Renée Zellweger tries to rescue a little demon girl. Rated R. At the Broadway, Mill Creek and the Fortuna. DEVIL. They're trapped in an elevator. One of them is the Devil. Yikes! Rated PG-13. 80m. At the Broadway and the Fortuna. THE EXPENDABLES. Jean-Claude Van Damme turned down this film for artistic reasons. There you have it. Rated R. 103m. At the Garberville. THE KIDS ARE ALL RIGHT. Teens conceived by artificial insemination introduce their birth father to their lesbian moms. Rated R. 106m. At the Garberville. LEGENDS OF THE GUARDIANS: THE OWLS OF GA'HOOLE. CGI-animated owl wars -- in 3-D! 90m. Rated PG. At the Broadway, 2D at Mill Creek. LET ME IN. Lonely kid likes the girl next door; too bad she's a vampire. Rated R. At the Broadway. THE TOWN. Ben Affleck robs a bank and becomes romantically involved with one of his victims. That's when you know you're irresistible. Rated R. 112m. At the Broadway, Fortuna and Mill Creek. WALL STREET: MONEY NEVER SLEEPS. "Greed is Good." This movie, not so much. 127m. Rated PG-13. At the Broadway and the Fortuna.